Ascending Butterfly: Hello Kitty® Fun In Fields MIMOBOT® Review and Giveaway! Hello Kitty® Fun In Fields MIMOBOT® Review and Giveaway! This giveaway is now CLOSED. Thanks so much to our wonderful sponsor MIMOBOT®, We look forward to working with you again! The winner has been notified and upon confirmation his/her follower name will be posted both here and on our homepage. Remember: There are still some great giveaways active on the upper right hand side of the page! Ƹ̵̡Ӝ̵̨̄Ʒ -There are certain things that still have the ability to bring out the little kid in me, one of my favorite memories of childhood was, is and always will be Hello Kitty®! I had the doll, pens, pencils, stickers, you name it, I wanted it! I still love Hello Kitty®, somehow she still manages to make me smile and makes me feel just plain happy! Ƹ̵̡Ӝ̵̨̄Ʒ - Cool Factor: She comes pre-loaded with desktop wallpapers, avatars, and icons for your desktop! Hello Kitty® Fun In Fields MIMOBOT® transports the sweet, cute, friendly and legendary Japanese icon into MIMOBOT flash drive form. 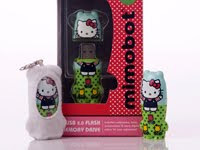 Become one of her newest friends today, by adding this Mimobot USB to your Hello Kitty collection! It's no surprise to me she is a Top 12 BestSeller at MIMOBOT®, you can shop the top 12 directly HERE! How to Win: (1) You must be a PUBLIC follower of Ascending Butterfly to be eligible for this and all giveaways. Indicate in your entry that you follow (if your 'comment name/user id' differs from your profile id, please let me know what name you follow under) and (2) Visit MIMOBOT®, and tell us which Hello Kitty MIMOBOT® ASIDE from Fun In Fields that you like! (3) You must also leave your email address somewhere in your comment. (You can format it this way for security, example: ascendingbutterfly AT mail host DOT com). (If your email is clearly visible in your profile, you can just say so, that's OK!) Please follow the easy 1, 2, 3 steps to winning! This giveaway is open to USA residents who are 18 years of age or older. I'm a new follower and I like the Hello Kitty® Apple MIMOBOT. I follow as Sheila Branyon. I love the Hello Kitty® Teddy Bear MIMOBOT®.Email is visible in my profile. Facebook Fan of Mimobot and wrote on their wall that you sent me. Voted for bloggers Choice vote count #4! I would also love the Hello Kitty Balloon! I voted for you on BLoggers Choice! i like the hello kitty balloon mimobot! I love the Hello Kitty® Apple MIMOBOT®, oh so cute! I have your butterfly button on my blog. I like the hello kitty apple mimobot. rayreadb at yahoo dot com. I am a follower. I like the Hello Kitty apple mimobot.I follow you on google connect. I follow through google friend connect. I also love the Teddy Bear MIMOBOT. I follow your blog as Jennifer G.
Subscribed to receive Ascending Butterfly e-mails. I love the hello Kitty Teddybear Mimbot. I follow Mimobot on Facebook. I follow Mimobot on Twitter. Google friend follower, and I like the Balloon Kitty. I also like the Hello Kitty Balloon Mimobot. I'm a public follower (Jamie Nelson). My favorite is the Hello Kitty Apple MIMOBOT. i love the apple mimobot! I follow you (Kristin). My choice would be the Hello Kitty Balloon MIMOBOT. Public Follower - susitravl - and I love the Balloon MIMOBOT. i like the Hello Kitty® Balloon MIMOBOT®. I think my favorite HK Mimobot is the balloon mimobot. I follow your blog. I love the Hello Kitty Teddy Bear MIMOBOT! I follow MIMOBOT on Facebook and let them know you sent me. I sent a friend request to MIMOBOT on Myspace. I follow MIMOBOT on YouTube. I like the Apple MIMOBOT!